Chapel Hill has a new-ish restaurant (okay, not that new, I’m a bit behind) in the Courtyard where Sandwhich used to be. Vimala’s Curryblossom Cafe is absolutely a product of the locavore, sustainable, community-friendly, healthy-but-good eats food movement. Vimala Rajendran, who owns and runs the restaurant with her children and is the executive chef, has opened a restaurant that I am more than happy to visit repeatedly! I’ve gone twice for lunch and both meals were excellent and affordable. I’m excited to try their dinner menu and some desserts as well. 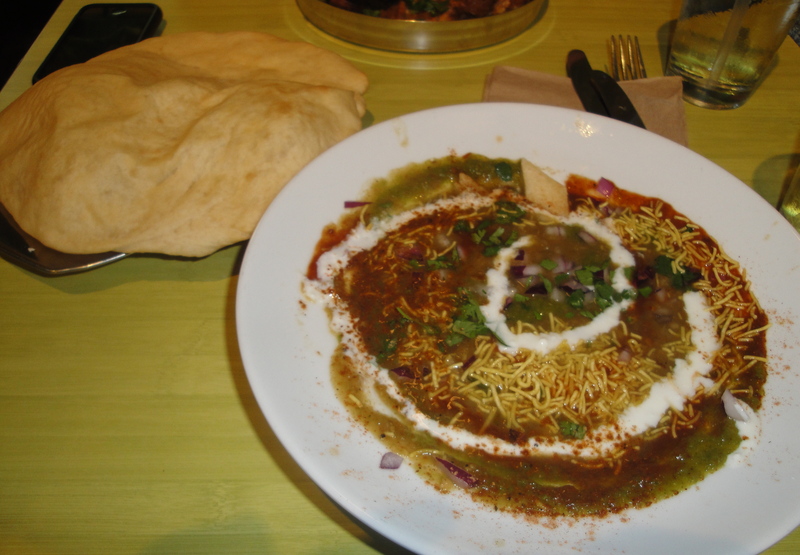 I have tried the chole bhatura plate (Slow simmered chick pea curry served with bhatura. Our bhatura is made with Lindley Mills organic flour and Mapleview yogurt, puffed into a balloon. Punjabi dhaaba classic. $7), the tandoori chicken (Local organic chicken, marinated in Vimala’s tandoori masala and Mapleview yogurt, grilled. Served over salad. Gluten free. 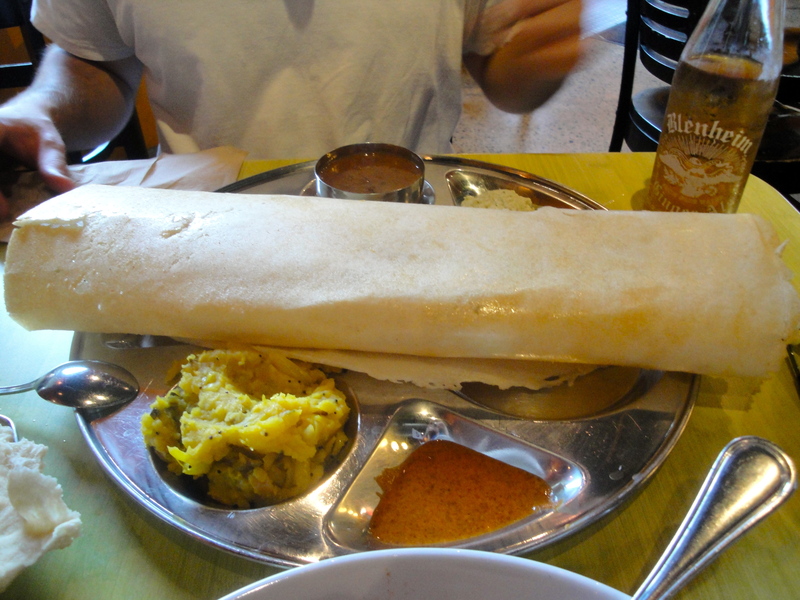 $8), and the masala dosa (Rice and urad dal fermented into batter and poured into a thin crêpe. With sambaar, coconut chutney and a potato bhaji on the side. Kerala and Tamil Nadu favorite. Gluten free & vegan. $7). All three were excellent but the chole bhatura was by far my favorite. A toothsome, flavorful chickpea curry with a fantastic yogurt-based pita like bread on the side. Who knew chickpeas could have so much flavor?! I couldn’t even tell you half the spices that were happening in the mixture. 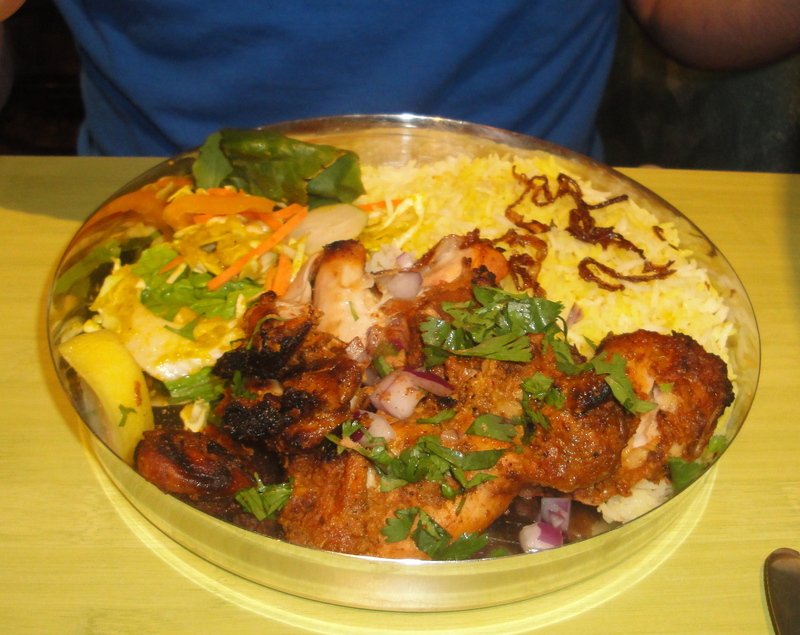 The tandoori chicken was good as well, light, tasty, not at all dry, served with rice and a salad. A good, healthy option if you are looking to go low carb, high protein. I also wanted to try the dosa platter, as I love me some dosa. Not my favorite dosa ever but it was solid and served with a nice array of dipping sauces and sides, ones of which was incredibly spicy but it was opposite a nice, cooling yogurty sauce. I have tried their lavender lemonade, which is refreshing but not all that lavendar-y (or sugary either, this is a real lemonade) and this intense, spicy ginger ale beverage from their refrigerator. I am really excited to try their desserts, especially the mango kulfi. Love me some mango kulfi. The great thing about this food, especially if you love Indian food, is that it isn’t heavy. In fact Vimala’s is one of the few places I have eaten Indian food that hasn’t left me stuffed and sleepy afterwards. The food is light; it tastes healthy and nutritious. There are plenty of vegetarian, vegan, and gluten-free options if you are into that sort of thing. Also, did I mention that this place was all community-based? The second time I was eating there a student group came by on a tour to learn about local and sustainable food systems–they’d just come from the Carrboro Farmer’s Market (well, we’d been there too) so, yeah, there you go. One note: I have hear that at times the wait for food can be inexcusable. I have not yet had this problem as I have only gone during “off” hours–as in, right after they open for lunch. Evidently even take out orders can take a long time during busy hours. Hopefully they’ll get these organizational issues worked out, as the food is fantastic and I’d hate for people to be turned away by the wait. I know I’ll be heading back (during not-peak hours) to enjoy more of Vimala’s food soon!